Using permanent marker on a dry-erase board is an accident that can happen to anyone when these two items are in the same room. If it’s ever happened to you, then you know what the fuss is about. They aren’t called permanent markers for no reason. Most often, you end up in a tizzy trying to get it off your dry-erase board as fast as you can. A dry-erase board, sometimes called a whiteboard, has become an essential in today’s academic and corporate world. Being easy to move around and reusable, dry-erase boards are common in classrooms, offices, conference halls and even homes. Well-used dry-erase boards take a lot of abuse. Aside from permanent markers, sometimes smears and smudges from old dry-erase markers are left behind. 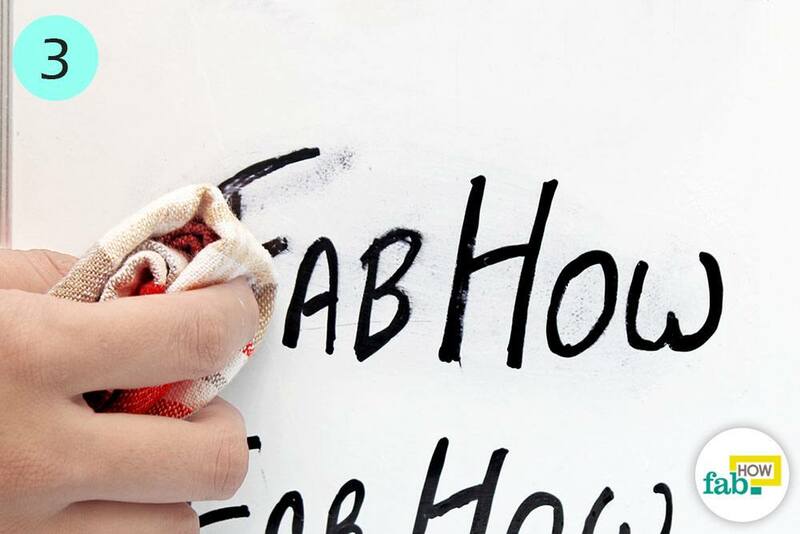 Residue of old ink stains, permanent or temporary, can give a cloudy and messy appearance to the otherwise sparkly whiteboard. 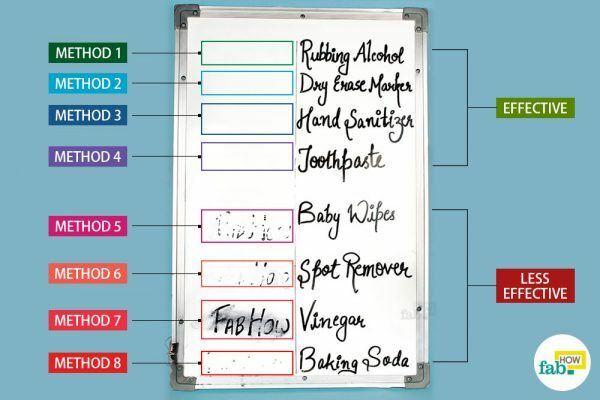 If you find that cleaning your dry-erase board is quite a hassle, there are many methods that can make it easy for you. While effective, ready-made cleaners might not always be in your budget. Fortunately, there are many things you can use to clean the board. 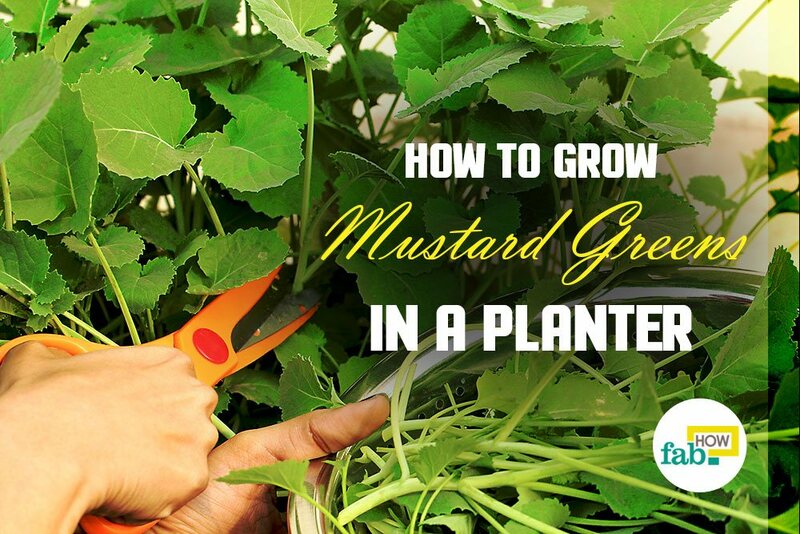 These items are not only easy to get your hands on but are also cost-efficient. 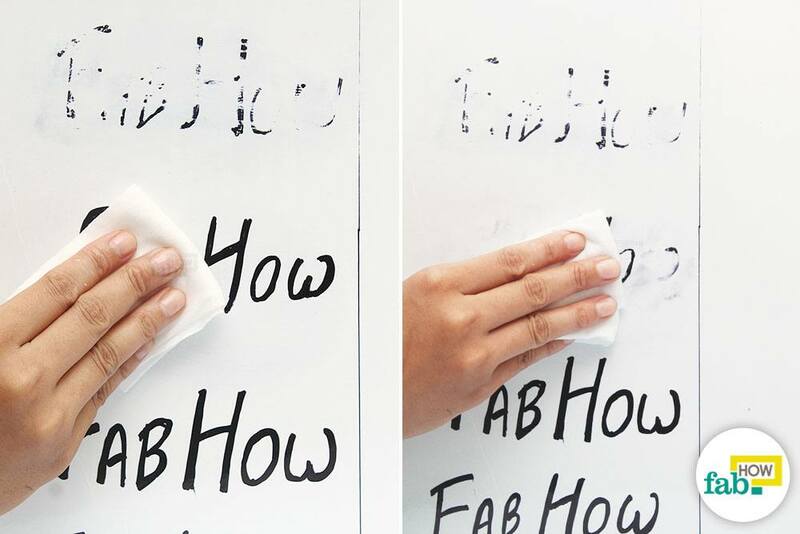 We tried eight methods to clean permanent marker stains from our dry-erase boards. 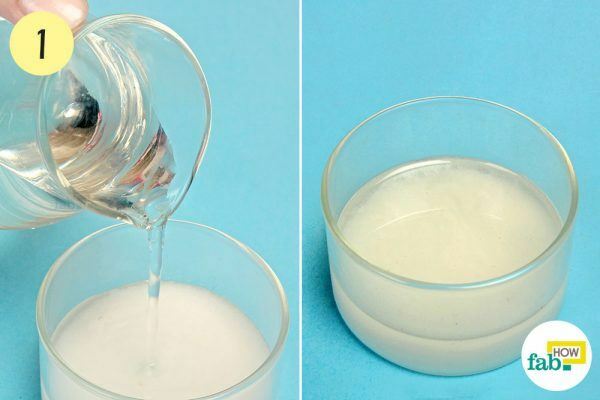 Out of the eight cleaning agents that have gained popularity over the Internet for this purpose, we found that only four produced good results. 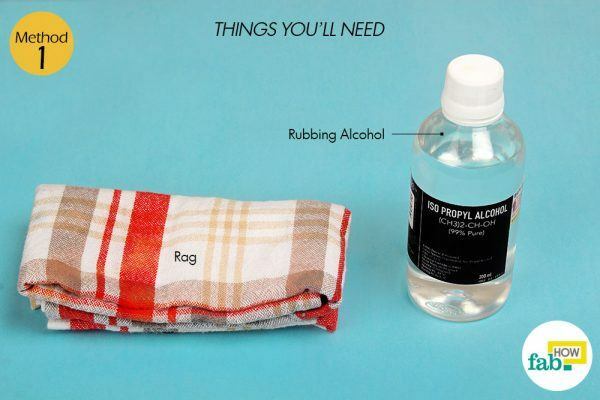 Rubbing alcohol, dry-erase markers, hand sanitizer and toothpaste – of which the first three are alcohol-based – proved to be quite efficient. With some effort, baking soda also produced satisfactory results. While baby wipes and spot remover fell flat to the numerous online claims stating otherwise, white vinegar failed completely. We may finally have found a cleaning job that white vinegar cannot tackle. As for the baby wipes, most brands produce alcohol-free wipes these days. You may get some success if you use baby wipes that contain alcohol to clean your dry-erase board. So go ahead and try these 8 methods with real results to clean a dry erase board. 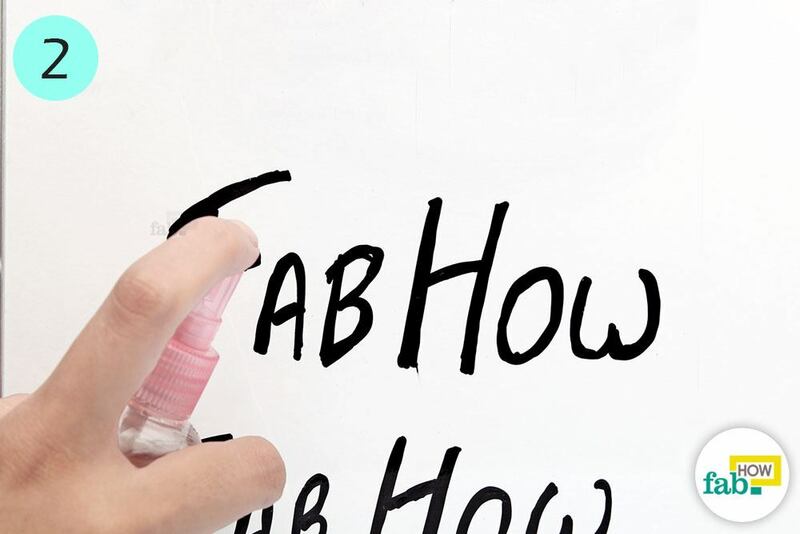 Rubbing alcohol works like a charm to clean dry-erase boards, as it is effective on a variety of inks. Most inks, even the ink in permanent markers, are soluble in rubbing alcohol. 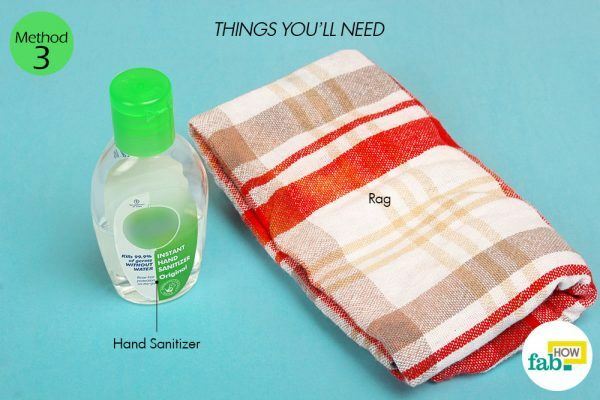 Saturate the end of a clean rag with 90 percent isopropyl alcohol or rubbing alcohol. 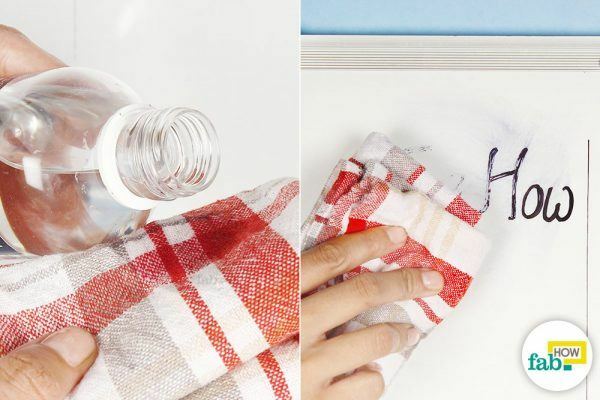 Rub the alcohol-soaked end of the rag over the markings on the dry-erase board until all the ink stains come off. If the ink stains are old and permanent, you can also spray some rubbing alcohol directly on the board. When the ink starts dissolving, wipe it off with a clean rag. Scribble over the old markings with a dry-erase marker, covering the old ink stains entirely with fresh ink. The solvents in the fresh ink can reactivate the ink of the old marker stains, thus allowing the old ink to come off with the fresh one. 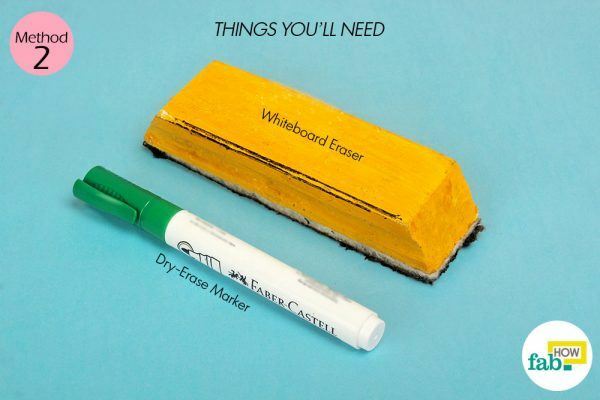 Without any delay, wipe the entire area with a whiteboard eraser. 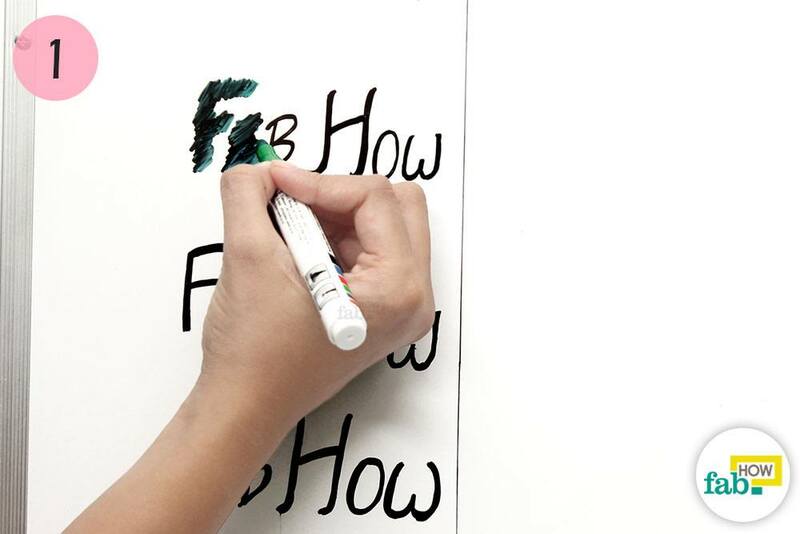 Both inks – the old and the new – should easily come off, leaving your dry-erase board clean and spot-free. If you don’t have rubbing alcohol on hand, alcohol-based hand sanitizers can also be used to clean dry-erase boards in a pinch. The alcohol present in them reactivates the ink and helps lift it off the surface of the board. Squirt a little hand sanitizer on a corner of a rag. 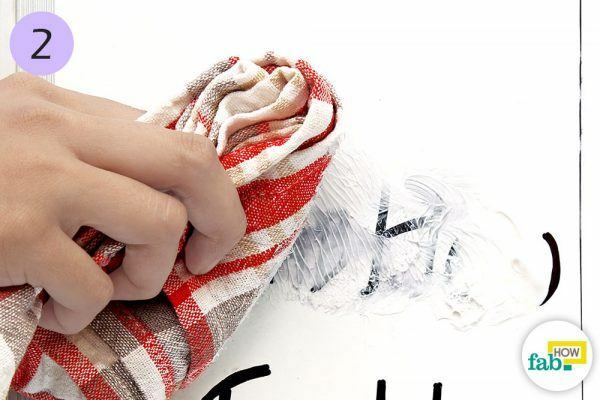 Wipe the stained area on the board with the soaked end of the rag to lift off the old ink stains. Take a tube of generic white toothpaste and squirt it over the old ink stains. The colorful, gel toothpastes won’t work as well. 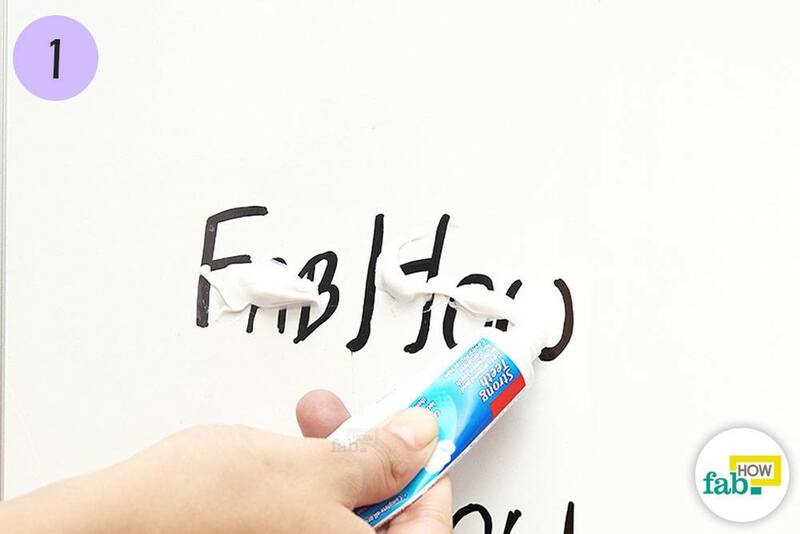 White toothpaste works as a very mild abrasive to clean the ink stains from your dry-erase board. 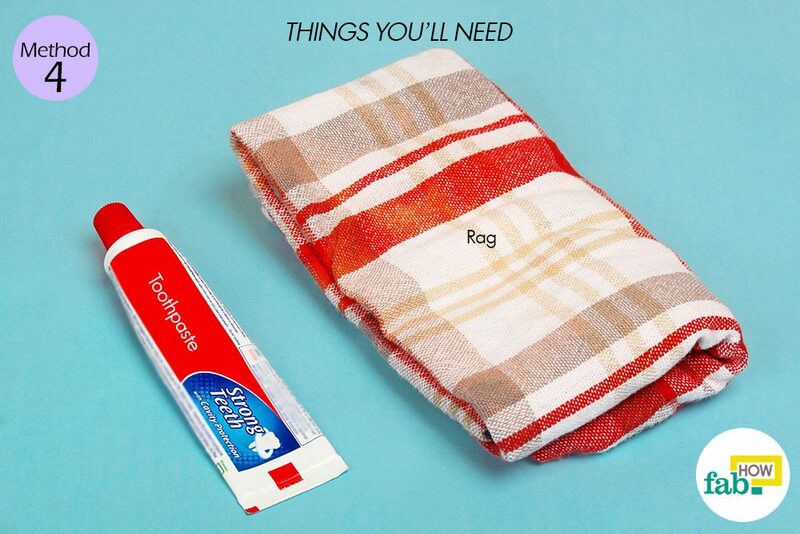 Use a rag to rub the toothpaste over the entire area with ink stains. Buff and polish the area and you’ll see the old ink coming off. Finish by wiping down the board with a clean end of the rag. 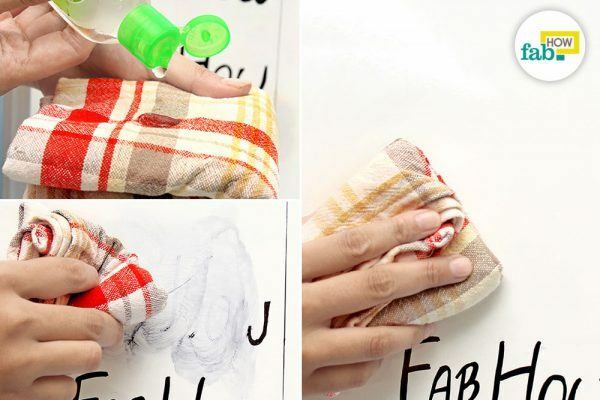 Simply pull out a baby wipe and wipe the ink stains off the dry-erase board. Besides being a little moist, baby wipes also contain a little alcohol that helps lift off ink stains from a dry-erase board. They are also a very handy and hassle-free option if you already have them in your house. 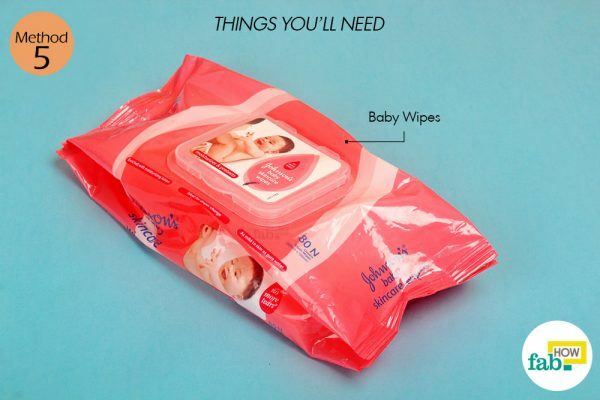 Baby wipes may not be as effective in completely cleaning off ink stains that are very old. The effectiveness may also depend upon the brand you use. If the product claims to be alcohol-free, it may not work for the task at hand. Spray a spot remover like a glass cleaner over the old ink markings. Some of the old ink will dissolve and start streaking down along with the glass cleaner. 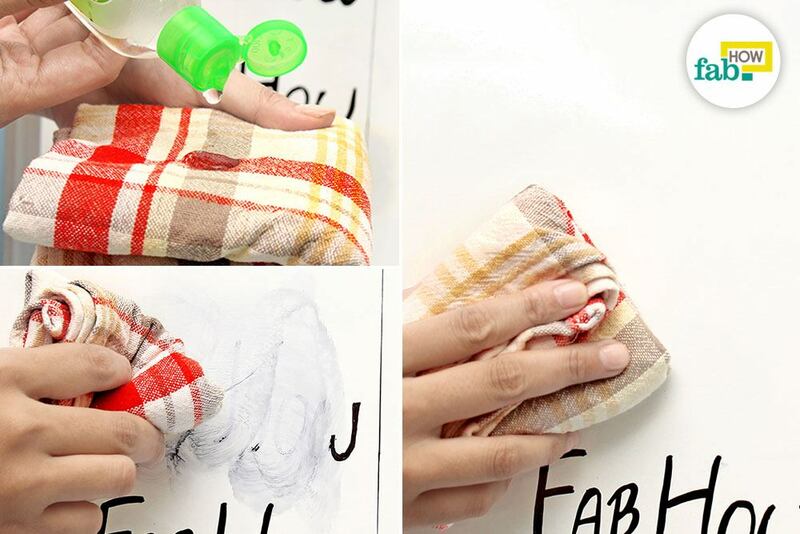 Give the area a wipe down with a rag to remove the ink stains. Glass cleaners may not be as effective on old, permanent marker stains, so you may need to repeat the procedure a couple of times to achieve your goal. 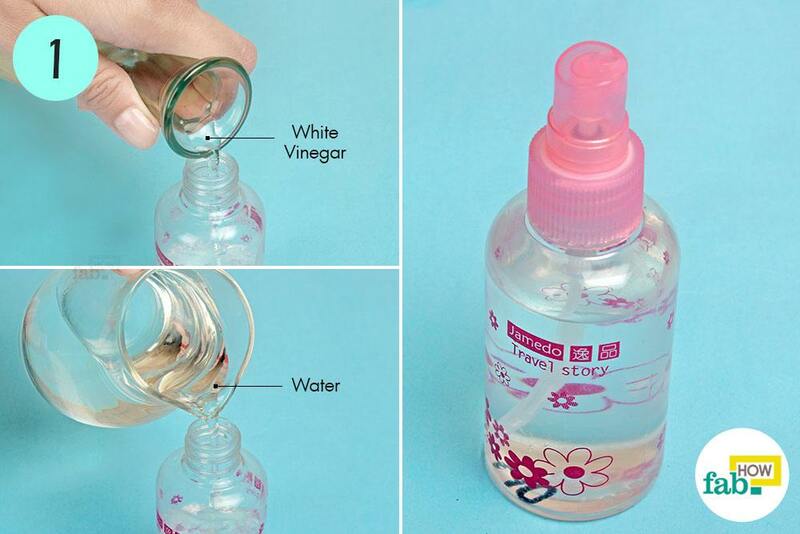 Pour some white vinegar into a small spray bottle. 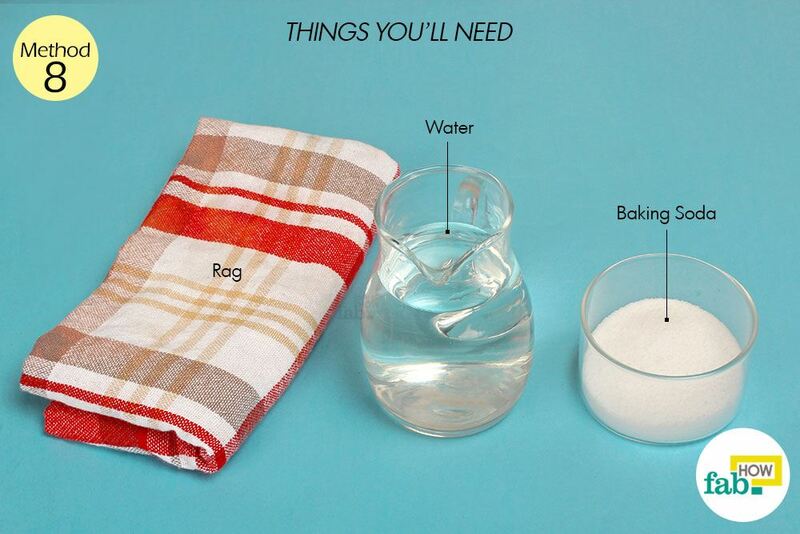 Add an equal amount of water to the bottle. Close the bottle and give it a shake to mix the contents. Spray the diluted white vinegar over the old ink stains on the dry-erase board. Give the stained surface a thorough wipe-down with a rag. You may need to repeat the process a couple of times. 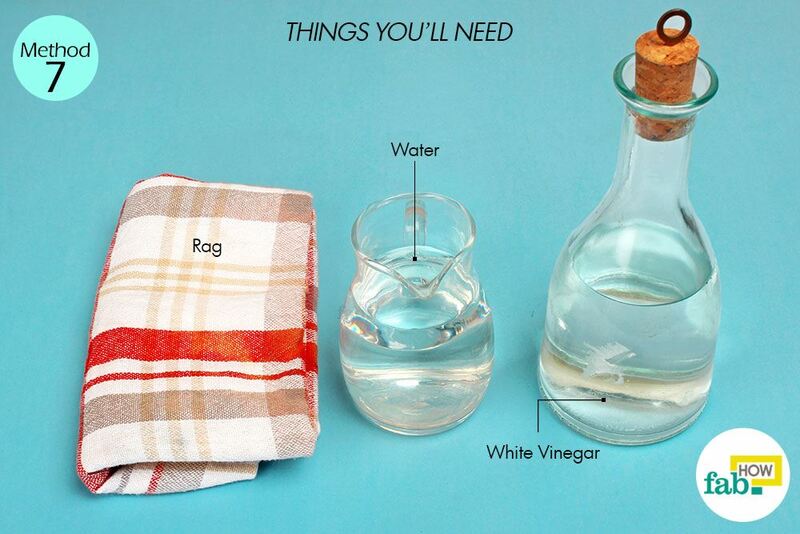 If the vinegar solution doesn’t seem to be making a dent in the stains, ditch it and try another method. Add water to the baking soda and make a spreadable paste. 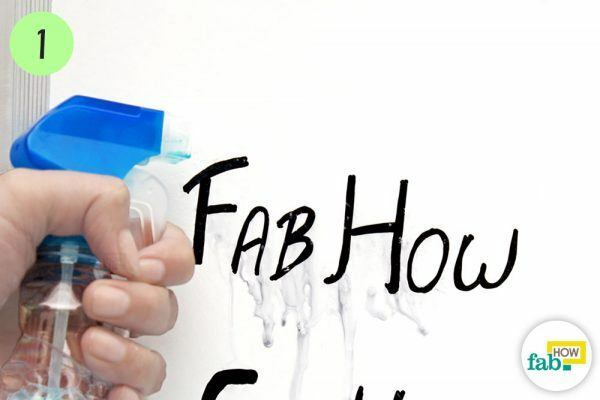 The mildly abrasive property of baking soda can help clean the ink stains off the dry-erase board. Apply the baking soda paste over the old ink stains on the dry-erase board. 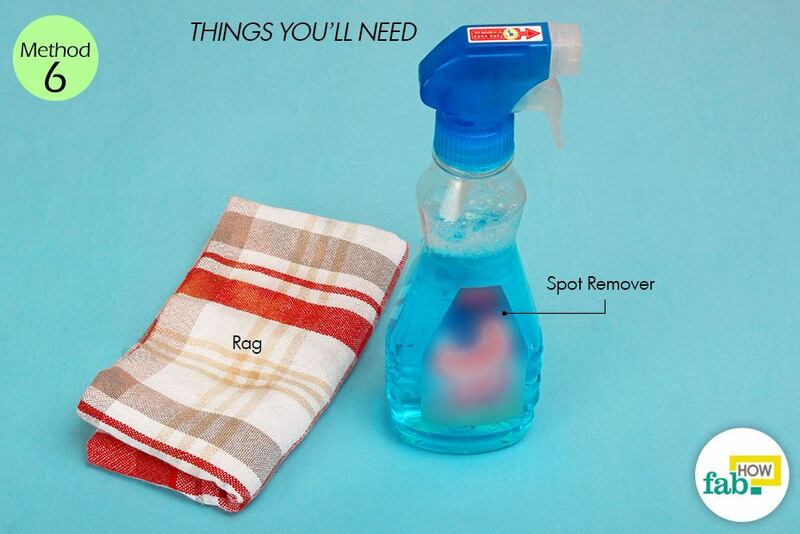 Buff the surface with a rag to remove the stains. This may take some effort, but the baking soda can clean your dry-erase board if the ink is not too stubborn. Try to get to the ink as soon as you can. The more the ink ages, the more permanent it becomes. Always start with mild cleaners and work your way up to the tough ones. Heavy-duty cleaners like rubbing alcohol should not be used very frequently in order to prolong the life of your dry-erase board. 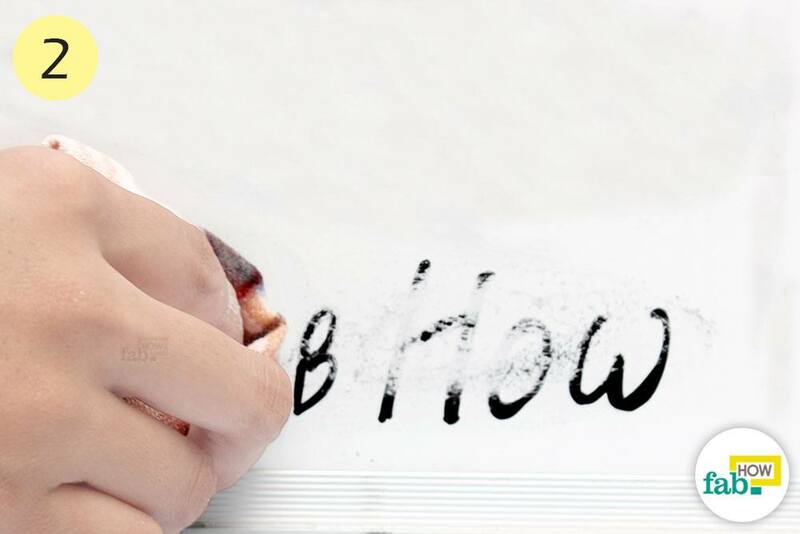 Never use plain water to clean the ink stains off your dry-erase board. 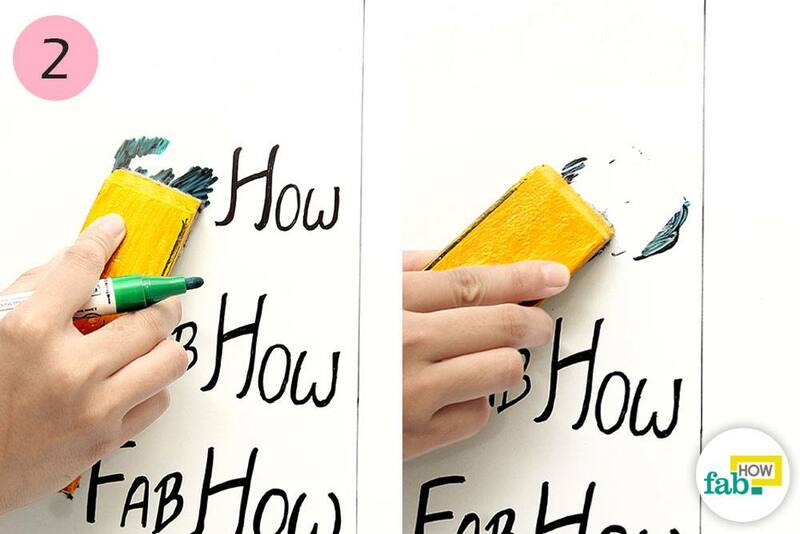 Some dry-erase boards may absorb the water, sealing in the colors from the ink stains. Never use abrasive cleaners or scouring pads to clean dry-erase boards. They may end up damaging the surface, which might make future stains more permanent. You can try hair spray, nail polish remover, etc. to clean your dry-erase board. Basically, anything with rubbing alcohol or acetone may lift the old ink off the board. After cleaning the dry-erase board, you can also buff its surface with a little baby oil on a rag for a smooth finish.